As upset as I am about Donald Trump being elected, I can't ignore the fact there is good that can come of it. Not because of him, but because there has to be. Disclaimer: By my stating all of the good that can come from this very unusual (I'm being nice) man in power, I am in no way condoning what he stood for and exploited throughout his entire candidacy and I am not in the least bit satisfied about him as our new President-elect. However, this is what we were left with. And I still believe in Michelle Obama's words, "when they go low, we go high". Well, 47% of the voters went low and now, I am trying to convince you to resist it and go high. HARD TRUTH: One thing that is for sure, if Hillary Clinton was elected, most of us would have sighed a breath of relief, and said to each other, "See? We didn't give people enough credit if we thought he was going to win. Love DOES trump hate and America IS good." November 9th would have marked the day in which we all went back to our normal lives with the added pleasure of having our first female president, seemingly putting this horrible election and all it dug up behind us.We would have picked up the broken pieces and made that our contribution. We would have felt the "deplorables" that came out of the woodwork were detained back to their baskets and racism, sexism, bigotry and the pure hate that we were constantly reminded of, now would soon have been a thing of the past....(for most of us). *Must be said: When I say "deplorables", I am talking about a small, sub-group of Trump voters, not anyone who would even read this post. I.e. the KKK freaks that are holding a victory rally 2 hours from my home in December, the men who think they can go around and just grab women now and this frighteningly odd group of white nationalists who now have a voice among us. But Hillary didn't win. And so I see that as a much needed wake up call. For some reason or another, those things Trump stood for on his campaign trail either didn't matter as much to people who voted for him or people just didn't care about what he said. Either way, it doesn't make a difference to me right now because it all leads to the same outcome. Donald Trump will be our President. This is where we are as a nation. I know I don't typically spend my days around deplorables, but I do spend some days among people who voted for him despite all of the moral disgust he represents. Therefore, I believe we need to rise up and subtly convince those people that it does matter. So what can we do, you say?! Hillary didn't win and so that means we actually have even more work to do than what she talked about at the debates, speeches and rallies. And I think this is a perfect opportunity for us to ask ourselves, "Am I doing enough?" If not, think about what inspires you and the things that feed your soul. Is it the environment, social justice, politics? What makes you excited at the possibility of a real change, within your world? 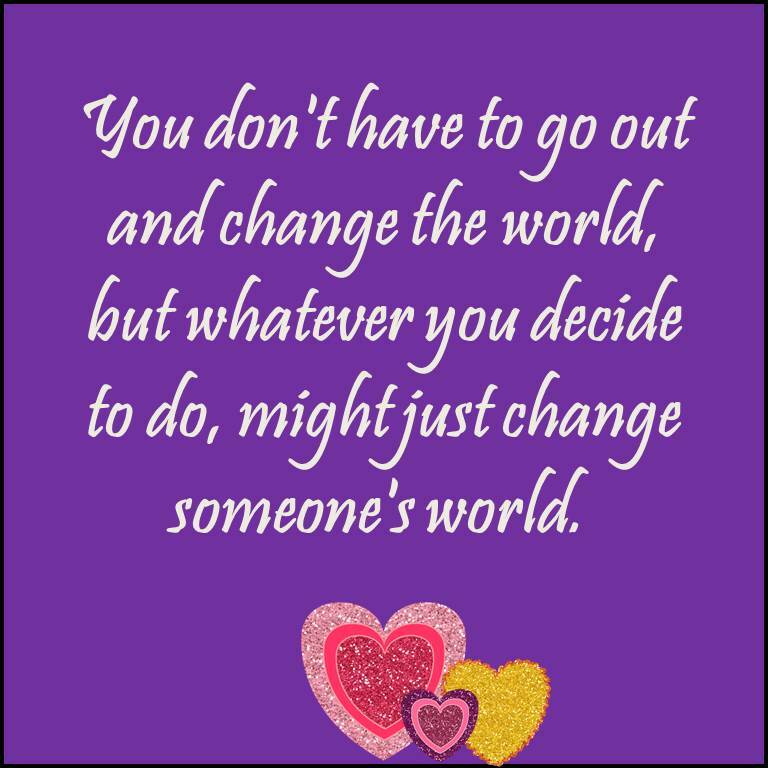 Most of us can only really change the immediate world that we live in. By that, I mean, our community, our everyday lives. 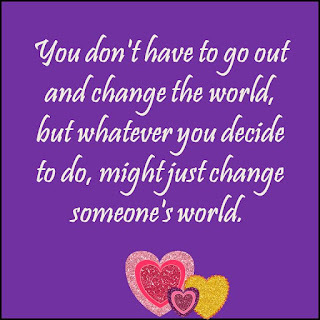 You don't have to go out and change the world, but whatever you decide to do, might just change someone's world. And that is a really special thing. I found myself living my very own dream about 4 years ago and I am so thankful for the opportunity. I am at a Friends School teaching fifth grade and I love every minute of it. Prior to coming here, I worked within inner city schools in Baltimore, Harlem and Philadelphia. As tough as my days were, I felt a sense of purpose and comfort in knowing that I was sometimes the only light in a child's day. I believed I was inspiring them, on some level, to believe in themselves and their own dreams. It fulfilled me in a unique way and I often regret leaving behind that community. 1. Throughout my time at Friends School, once in a while, my conscience would nag at me about this move I made. I finally decided that I will continue the work I did with at-risk kids where I am living now. I kept thinking about where I could start and what to do. Tutoring after school, doing fun activities with the kids on the weekends, things like that. I haven't settled on what exactly yet. However, I knew that I needed some guidance. I remembered when a lady came to our school to speak about this kind of work that she does in Wilmington. I searched for her on the internet and found the contact info. to email her, and we are meeting for coffee in the coming days! Maybe you are thinking of doing something, but not sure if you should reach out. Don't be shy. Trust me, when you say to someone that you want to help, they will embrace the idea. It is so great for anyone to know that someone else is willing to be a part of the good things that are happening. So if you are wondering where you can start with getting involved, think about any type of connection you might have. Ask around to see if people you know have a connection. Chances are, you will find someone who can point you in the right direction. 2. I am also working within my classroom to continue to teach the concept that love and kindness are at the heart of being the best version of yourself which, happens to be, my 5th grade curriculum's overarching goal. At first, I wondered how I could still teach my students that love "wins" after this election. That was (and some ways still is) a difficult question. I felt like a sham, a fake and a fraud. How could I teach them that love drives out hate when there up on their screens every night was a real-life battle of Love vs. Hate/Fear/Anger? Whether we like it or not, the campaigns fell into that order and hate won the election. So, now what? Well first, the popular vote was won by Hillary Clinton (right now by about 800,000 votes which means about 61 million people voted for her and another 7 million for another candidate, so all in all about 68 million people did not vote for Donald Trump. These numbers also beg for a lesson on the importance of voting when there are about 219 million people eligible to vote in our country) The other fact is that it takes more than one fight. When I teach about Human Rights in the winter, I will remind my students that there were plenty of times when love lost and we got up and fought again. We still have fighting to do and it is only when we lose hope, that we can say hate won. Until then, we power on. More Ideas: When I told someone that I wanted to do more, he said, "You're a teacher. You're already doing something great." And that's true, but that doesn't mean we don't have other passions, too. Maybe volunteering at a hospital or working with an environmental group is something you would look forward to every Sunday. If you are looking to relocate, a colleague suggested that teachers should go to a Red state and teach, I would say also consider a Red county. Maybe you want to work in a school that better reflects what you believe and you feel would allow you to make more of a difference. Maybe you are a retired teacher and you always thought it would be fun to work in a cafe or bookstore. Take a percentage of your paycheck and donate it to a charity or foundation or use it to buy books for a new teacher. If you are a teacher in the classroom, there's plenty more you can do. Form an after school club that volunteers somewhere that the kids are interested in helping. High School teachers can teach students how to navigate falsehoods on the Internet and promote learning the facts and forming opinions based off of your own independent research. There is literally a never-ending list of things we can add into our lives to make our community a better place. I encourage you to even try lending a hand in a part of the community you are unfamiliar with. The more we experience, the more we learn, the more objective and empathetic we become. If this election season has taught me anything, it is that there is always work to be done, no matter who is sitting in our White House. Julia-I agree with everything you're saying. It's always harder to take the high road and that's what we all have to do. I didn't vote for him, but I hope he proves me wrong. I hope he succeeds. I would love nothing better than admitting I was wrong. However, I still have a pretty big "I told you so" chip on my shoulder, ready to use that when the first thing goes wrong. I have to learn to take the high road. It will be a struggle but I have to remember others are watching, namely my 16 yr old son. It's his future I lose sleep over but I have to remind myself that the next generation is smarter and stronger than we are. We have to have faith in them. And I do. Your posts always get me all teary eyed and inspired! Thank you for sharing!!! Check at http://essayservices.reviews/services/customessaymeister review of Custom essay meister that says a lot on elections and how they may change everything or not.